Exell 3.6V 700mAh Baby Monitor Battery for Topcom Babytalker 1010, Babytalker 1020, Babytalker 1030, Twintalker 3700. TOPCOM Babytalker 1010, Babytalker 1020, Babytalker 1030, Twintalker 3700. Topcom: Babytalker 1010, Babytalker 1020, Babytalker 1030, Twintalker 3700. Battery replaces KEBT-086-B, 3XCAAA, 53617. Battery fits Motorola SX800, FV700, SX500, SX500R, SX800, SX800R, SX900R, FV300, FV500, FV700R, SX600, SX900. in a flash. during checkout. We make every effort to get your order to you. Saft: 403023003. Closeout Sale Coin Cells - Lithium Components Cordless Phone Batteries Cordless Phone Battery Credit Card Reader CURRENT SALES! 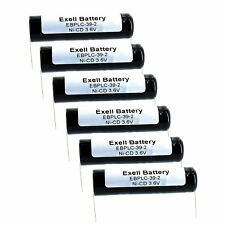 TheExell EBPLC-39-2 3.6V Ni-CD Battery has better performance (higher capacity) and reliability (longevity & safety). If you are a novice or an old pro, these batteries will keep you powered up. Amperage: 3300mAh. Chemistry: NiMH. Closeout Sale Coin Cells - Lithium Components Cordless Phone Batteries Cordless Phone Battery Credit Card Reader CURRENT SALES! If you are a novice or an old pro, these batteries will keep you powered up. Amperage: 3300mAh. Chemistry: NiMH. High quality Ultra High Capacity NiMH battery. Cell Count: 3 x SubC. Connector Type: Button Top. C to 85?. C, giving an effective shelf life of 10 years.OmniCel ER32L100 Battery Specifications OmniCel ER32L100 3.6V 1.7Ah Size 1/6D Lithium High Energy Battery with Nickel Pin. OmniCel ER32L100 Battery Replaces: Tadiran TL-5935, 1/6D. Capacity: 2750mAh (2.75Ah). during checkout. in a flash. We make every effort to get your order to you. Lintronics: N50SB3, NSB3. AT&T / Lucent: 560. Closeout Sale Coin Cells - Lithium Components Cordless Phone Batteries Cordless Phone Battery Credit Card Reader CURRENT SALES! TheExell EBPLC-39-2 3.6V Ni-CD Battery has better performance (higher capacity) and reliability (longevity & safety). Closeout Sale Coin Cells - Lithium Components Cordless Phone Batteries Cordless Phone Battery Credit Card Reader CURRENT SALES! during checkout. in a flash. We can assist to help you finding the correct product or cross referencing your product. Capacity: 2500mAh (1.50Ah). during checkout. We make every effort to get your order to you. in a flash. Part Number: B9592T. We can assist to help you finding the correct product or cross referencing your product. Capacity: 2500mAh (1.50Ah). during checkout. We make every effort to get your order to you. in a flash. We can assist to help you finding the correct product or cross referencing your product. If you are unsure or just want to confirm your selection, give us a call. Closeout Sale Coin Cells - Lithium Components Cordless Phone Batteries Cordless Phone Battery Credit Card Reader CURRENT SALES! Height: 0.56". during checkout. We make every effort to get your order to you. Battery fits Motorola SX800, FV700, SX500, SX500R, SX800, SX800R, SX900R, FV300, FV500, FV700R, SX600, SX900. Motorola: FV300, FV500, FV700, FV700R, SX500R, SX600, SX800, SX800R, SX900, SX900R. Battery replaces KEBT-086-B, 3XCAAA, 53617. Capacity: 1000mAh (1.00Ah). in a flash. We make every effort to get your order to you. We can assist to help you finding the correct product or cross referencing your product. If you are unsure or just want to confirm your selection, give us a call. If you are a novice or an old pro, these batteries will keep you powered up. High quality Ultra High Capacity NiCD battery. in a flash. We make every effort to get your order to you. We can assist to help you finding the correct product or cross referencing your product. Capacity: 1000mAh (1.00Ah). in a flash. We make every effort to get your order to you. Exell EBS-5090 Ni-MH 3.6V Battery Fits Symbol VC5090, VC5090-MA0QL0GH6WW, VC5090-MA0QM0GH67R, VC5090-MA0QM0GH6WR, VC5090-MA0TLQGH6WW, VC5090-MA0TMQGH66R, VC5090-MA0TMQGH6WR. Symbol: VC5090, VC5090-MA0QL0GH6WW, VC5090-MA0QM0GH67R, VC5090-MA0QM0GH6WR, VC5090-MA0TLQGH6WW, VC5090-MA0TMQGH66R, VC5090-MA0TMQGH6WR. Amperage: 17000mAh. 3.6V Lithium PLC Computer Backup Battery Replaces: Allen Bradley 1756-L55M1x, 1756-L55M2x, 1756-L6x. Need more than one EBPLC-108AB Lithium PLC Battery?. Exell Battery: EBPLC-108AB. 3.6V ATM Machine Battery Fits Resistacap N250AAAF3WL Replaces CUSTOM-122. Resistacap Inc: N250AAAF3WL. Resistacap Inc.: N250AAAF3WL. Closeout Sale Coin Cells - Lithium Components Cordless Phone Batteries Cordless Phone Battery Credit Card Reader CURRENT SALES! Closeout Sale Coin Cells - Lithium Components Cordless Phone Batteries Cordless Phone Battery Credit Card Reader CURRENT SALES! Fits and Replaces Cobra, Panasonic, Sharp, Sony, and Uniden phone batteries. Cooper Industries: LPX70RWH. Sure-lites: 026-148, 26-148, 41B020AD13301, LPX70RWH, SL026-148. in a flash. We make every effort to get your order to you. during checkout. Length: 1.98". About BatteriesInAFlash.